You never really know what you’re going to encounter when you set sail on the open waters. Even if you spend every day on a boat, surely something will surprise you. The marine life that lives just under the surface of the ocean is as fascinating as it is mysterious. Bridget Boudreaux and her husband often took their pontoon out onto the Calcasieu Ship Channel in Louisiana where they lived, and they were used to seeing all sorts of aquatic life on their journeys over the years. Not much could surprise them… or so they thought. Bridget Boudreaux and her husband were no strangers to the sea. They owned a pontoon and frequently took it out onto the open water, specifically the Calcasieu Ship Channel near their home. They loved sailing and all the adventure that came with it. Leaping out of the water in front of the massive cargo ship was a pink dolphin! Bridget could not believe her eyes. It wasn’t uncommon to see dolphins swimming in the channel, but a pink one was extremely rare. Although this was the first time Bridget saw a pink dolphin, it actually wasn’t the first time the animal had been spotted in the water. 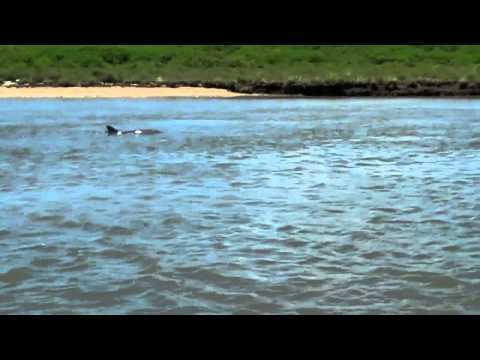 The dolphin, named “Pinky” by locals, had been seen sporadically since 2007. The first person to spot Pinky in the Louisiana channel was a charter boat captain several years ago. He was excited when he saw her because he knew how special and rare her coloration was. Pinky truly made the channel a unique place to sail! There was a scientific explanation for Pinky’s unusual coloration; it was actually caused by a rare gene that causes albinism in dolphins. Even though Pinky and her offspring were a pink hue, nearly all of the dolphins affected with the albino gene are completely white. Eric Hovland, the associate curator at the Florida Aquarium in Tampa, weighed in on Pinky’s unusual look. He said, “Pinky’s albinism is exceptionally rare, but not unheard of.” He was just as fascinated as Bridget was of the sighting. Even though Pinky was a rosy hue, she was still considered an albino. If her skin had no pigment to it, where did the pink coloration come from? That’s easy! Blood vessels and capillaries that were close to the surface of her skin caused the look. Since 1962, there have only been 14 documented sightings of albino bottlenose dolphins in the United States, and five of them came from the southeastern United States. Pinky was, by far, the most popular of them all. Although albinism is also rare in humans, it’s nowhere near as rare as with these aquatic mammals. Because of this, much of the research involving dolphins with albinism are actually based on scientific findings in humans. Albino or not, Louisiana’s Calcasieu Ship Channel is a common place to find bottlenose dolphins, and that makes it a popular place to go boating. People from all around like to spend warm days watching these beautiful creatures leap out of the water with grace. Gabriella Vazquez, a coordinator at Audubon Coastal Wildlife Network, pointed out that the channel is an ideal place for mother dolphins to teach their offspring how to forage for food, hence the high concentration of their numbers there. The channel also offers dolphins one of their favorite activities: surfing! When enormous ships pass through, they create huge wakes in front of their vessels. Dolphins love to swim just out in front of the ships and ride the huge breaking wakes, and that’s exactly what Pinky was doing when Bridget saw her! You might find this hard to believe, but Pinky is so popular with the people who frequent the channel that she actually has her own Facebook page! There, the 3,000 people who follow her chronicle their sightings of Pinky whenever they happen. Pinky and her offspring were swimming with other dolphins at the time Bridget took her picture, but those weren’t albino at all. In fact, both of Pinky’s parents were the typical gray color that nearly all bottlenose dolphins are. Pinky was just a lucky member of her species! Bridget and her husband sure were lucky to spot Pinky when they did. Even though Bridget wasn’t able to get a picture of both pink dolphins together, it was an experience neither she nor her husband will ever forget. Now, whenever the couple takes their pontoon out, they’re always on the lookout for Pinky! If you’ve ever been on a boat and saw a dolphin, then you know just how amazing these animals are. Pinky made for an even more astounding experience! Watching Pinky swim gracefully with her pod is truly a sight to be seen! If you ever find yourself on a boat in the middle of Louisiana’s Calcasieu Ship Channel, keep an eye out for Pinky! Share this awesome pink dolphin’s story with your friends.